Anyway, the newest trend with food products seems to limiting serving sizes in the hopes of curbing the obesity trend in America. Who hasn’t seen 100 calorie packets of Oreos, single serving cups of ice cream (so I won’t feel guilty about eating ice cream from the tub, not that I do anyway) and now miniature cans and bottles of soda. 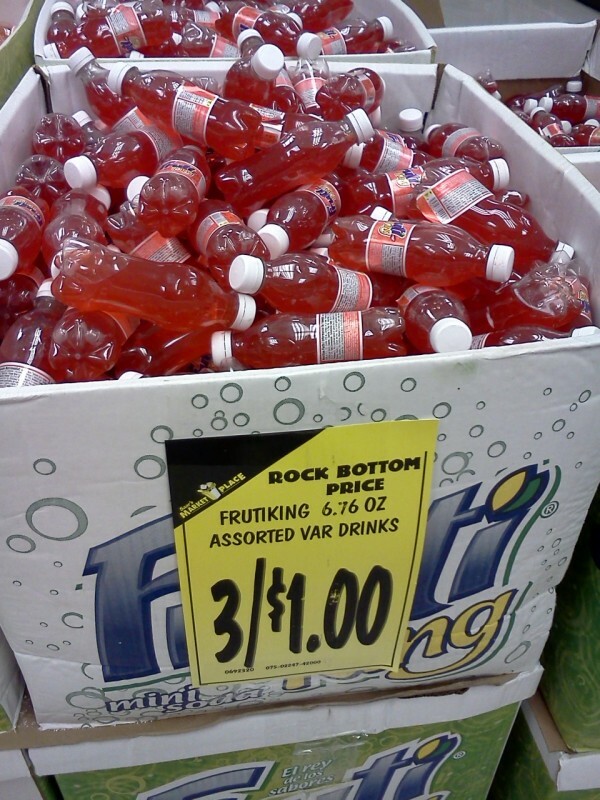 I picked up “Red” (or “Punch”) and “Orange” flavored Frutiking mini-bottles from Saar’s a few months ago (you can also find them in the bulk section at Winco, bulk soda – who knew?) and they’ve sat in my fridge ever since so I figured it was about time to try them before they turn into Frutiking Wine. On their website, Mexicorp, the makers of Frutiking describe the Punch flavor as “A blend of yummy tropical flavors that give a powerful taste” and Orange is “A delicious sweet citrus taste that everyone loves”. The website also features the statement (though more like command): “You will begin a new flavor adventure”. Like the ever popular Mexican Coca-Cola, Frutiking uses “real” sugar instead of high fructose corn syrup as a sweetener. In terms of content, it’s still got less grams of sugar than the same amount of Coca-Cola (18g vs. 21.8g), but in my beverage experience, brightly-colored sodas generally pack a syrupy saccharine punch. Upon opening both of the little bottles, I noticed a distinct lack of psshh! despite the first ingredient being carbonated water (agua carbonata, if you prefer). Now I don’t know if this is because of the age of the soda/chilling in my fridge forever or sub-par carbonated water, but I’ve never had a soda lose its fizz from just sitting around unsealed unopened. Despite the flatness, I still took a swig of each flavor. The immediately reminded me of a long forgotten childhood favorite: unfrozen/melted Otter Pops, just like their Poncho Punch and Little Orphan Orange counterparts. However, now as an adult and hearing daily warnings of diabetes and heart attacks, sadly Otter Pops and other such sugary things are not so suited to my grown-up palate. Ben’s photos are much better than mine. While I applaud Mexicorp/Frutiking for making little bottles, the soda was just too sweet for me to enjoy on a regular basis. 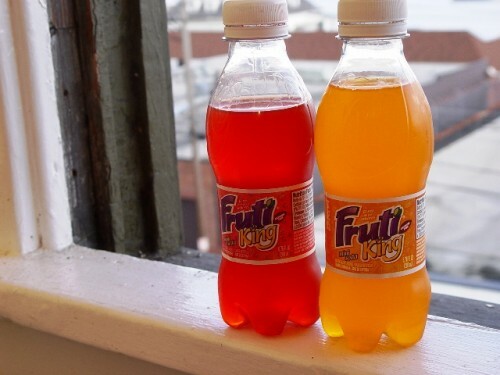 The flavors were nothing out of the ordinary, but Frutiking also comes in Apple, Pineapple, Lemon (Lime) and Grape. Sad fact: only 18 people like Frutiking on Facebook so maybe it’s not just me? If you’re really curious to try Frutiking, maybe pick up some of the bulk bottles at Winco for a sugar-alternative to Halloween candy (they carry the Pineapple flavor too) and pick up a bottle for yourself. This entry was posted on Monday, October 24th, 2011 at 7:21 pm	and is filed under Drinks. You can follow any comments to this entry through the RSS 2.0 feed. Both comments and pings are currently closed.